Hutch Owen has had many lives and roles, and can be found in many different published avenues. 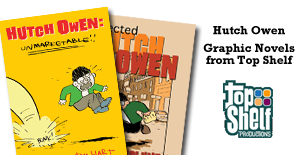 You can read the Hutch Owen webcomic at GoComics at the button below or browse more options below. A hilarious, enraged, snotty, and smart underground sensation! Hutch Owen’s acclaimed, award-winning dregs-of-society adventures skewer the multinational, mega-merging, corporate forces that control our lives. Tom Hart's popular vagrant/rebel Hutch Owen rages while the world around him builds, merges, attends marketing seminars and goes IPO. The streets and alleyways that are his bedroom and study are now invisible beneath a coat of crude and insulting ads. In an #Occupy World, Hutch Owen’s long-standing dissenting voice is a rallying cry for the #99%! 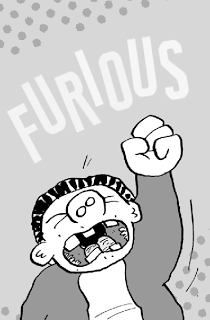 With three graphic novels to-date, and over a dozen stories, Hutch Owen was Furious When Furious Wasn’t Cool! He is the original occupier, fighting The Man to keep to his values and integrity in a cold and commercial world.